What is it? Thanks to its teardrop shape and tough exterior, the avocado is sometimes called an "alligator pear." But beneath that bumpy, pebbled skin, which ranges in hue from green to black, is the buttery yellow-green flesh of the avocado. Though it looks like a vegetable, the avocado is really a fruit, growing on the avocado tree in places like California and Florida. You can track down avocados at most times in the year, but they are at their best in the spring and summer. What is it good for? The avocado's creamy, butter-like texture may give away a hint that it's a high-fat food. But don't despair! An avocado's rich taste comes from monounsaturated fats, the heart-healthy type of fat that can help your body lower bad cholesterol (low-density lipids, or LDL). 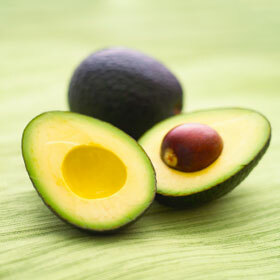 Avocados support heart health with lots of fibre, folate (also known as folic acid), and more potassium than a banana. The fruit is also a good source of antioxidants like lutein and vitamin E. And when paired with vegetables like carrots and tomatoes, avocados boost your body's ability to absorb certain antioxidants from those veggies, such as lutein and vitamin A. A word of warning, though: One cup of avocado contains 235 calories and over a third of a day's recommended intake of fat. What does it taste like? Slice into the tough skin of an avocado and twist apart its two halves, revealing the large brown pit inside. Scoop out or cut into the light-green flesh for a bite, and you'll taste avocado's buttery, slightly nutty flavour and feel its cool, soft texture. Because of its texture, avocado is a natural alternative to butter or mayonnaise on a sandwich and an ideally smooth addition to a spicy salsa or garlicky guacamole; whip it to make a sauce or add bulk and creaminess to soups, or just cut it up and add it to eggs, tacos, or (of course) salads - the recipe options are almost endless. When selecting an avocado, you can choose a ready-to-eat, darker, slightly soft fruit or you can opt for a firmer, greener one to ripen at home. If you choose a less-ripe avocado, ripen it in a paper bag or an open fruit basket.